What a week or two? Finally a day free to catch up and get some jobs done after one of the busiest weeks of the year on the guiding front. Over the past week I have been treated to some of the best fishing I have seen for quite sometime but alsoÂ the privilege of some fantastic adventures using helicopters and raft fishing. 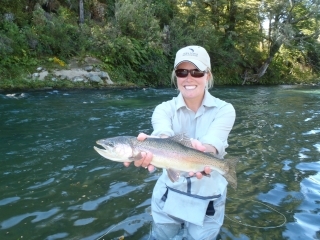 I had one of my biggest fish days in the upper Tongariro last Saturday with two lovely girls from Wyoming but have also been lucky enough to guide clients onto dry fly chomping browns in the backcountry. Local fishing has been good over the last couple of weeks and most anglers are still getting fish from most pools in the Tongariro but also the Tauranga Taupo. Â Conditions are quite low currently but fish are hungry and are very willing to take small naturals but also the well presented dry fly in the evenings. We have about a half moon at the moment which should make for good river mouth fishing on most drop offs but also should move the browns through. I finally found the first brown for the season the other day in the Braids but it was spent and hiding under the bank so we had no chance of hooking that fish. 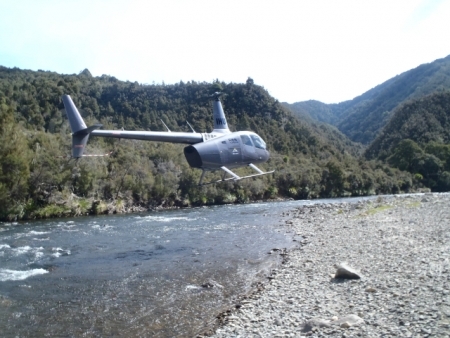 Reports of a few big browns that have moved into the Waitahanui has got anglers once again wet wading up the edges of this river but like always they are still hard to get to take the fly. The Upper Tongariro opened for angling last weekend as did other waters in the Taupo region and once again was a total hit. I raft fished this upper section Saturday and Sunday and just had fantastic days which resulted in a new You Tube video with some girls from the USA but also a repeat booking for the same date next year. The numbers of fish in the upper section currently is the best I have seen for quite some years which is great to see as last year was fairly patchy. One thing that never changes is the scenery in this section of river, absolutely out of this world and second to none. Opening day fish were fairly easy to catch and the girls certainly caught fish in every pool which we stopped at throughout the day. 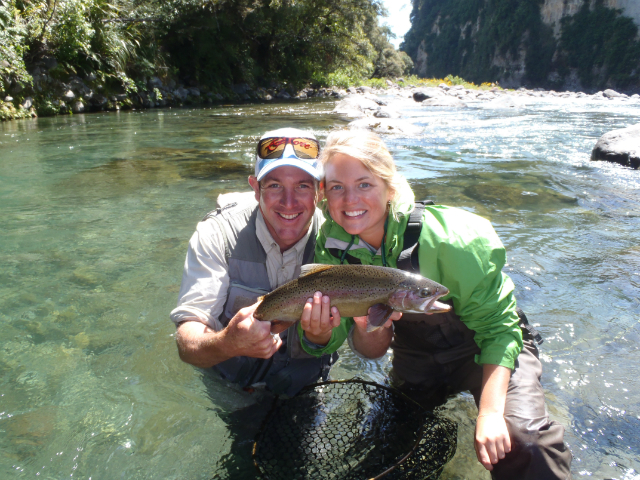 These girls were no strangers to catching trout as they were both fishing guides back home, pretty much a dream job for me actually. 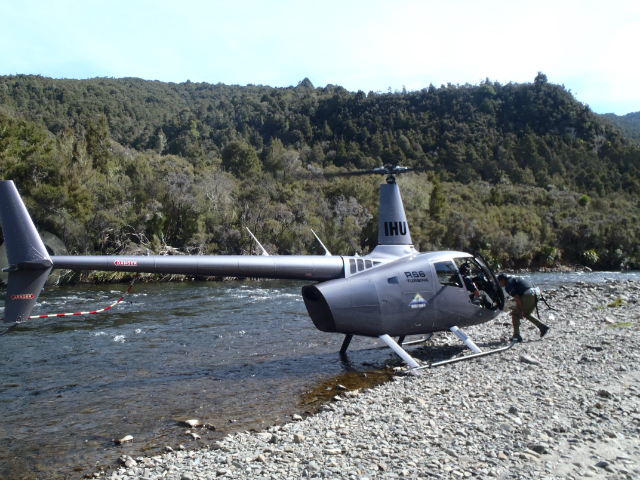 The last few days I have been flying in and out of the ranges with helicopters accessing some great water which has not seen much angling just yet. I was delighted to find fish on station and on the chomp which will change shortly with pressure these areas will receive over the next few months. These fisheries are strictly catch and release and fish are always taken care of but they will become very smart especially after they are pricked and water conditions become even clearer. As this is nearly all private water the rivers are rested for a minimum of four days after fishing which lets these fish settle back down and hopefully be feeding for when the next anglers go through. The weather in the backcountry was totally awesome and I was able to rise a few fish to the surface with a dry fly dropper. The majority of trout are still grabbing the nymphs before the dry but we managed some nice brownies using Para Adams in the tail out of pools or in the slower moving edges which fish can be found cruising. Fish are in amazing condition already and have recovered really well from the winter which isÂ a great as there could be some trophies getting about by March. Unfortunately for some clients these fish are simply too much and we certainly lost our fair share of trout through break off’s by stepping on line and simply being too hard on them-frustrating!! 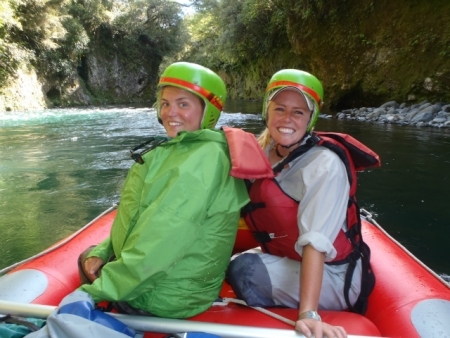 Another crazy week is in order next week and I will be raft fishing the Tongariro, taking the bikes into the Wanganui and also spending some time locally so we should have another good round up next week. Enjoy the pics and we will soon post the You Tube video on the website or you can just find it on the internet currently-worth the watch it really is.